Devo - Total Devo (30th Anniversary Deluxe Edition). Vinyl LP. Bleep. One transparent red disk and one transparent blue disk. Devo was a damn good band, weren’t they? The Ohio punks tore up the rule book when they arrived on the scene in the late 1970s, and it took the rest of the century for other bands to catch up. 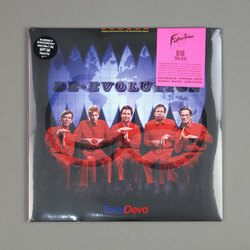 Now thirty years on from its release their seventh LP Total Devo is being given the reissue treatment courtesy of Futurismo. It’s a typically wacky package from the group. This Total Devo reissue is available in a choice of three editions - ‘Happy Sad’, ‘Totally Agitated’ and ‘Defcon Disco’, each of which comes with two differently coloured vinyl. All three of them contain the same set of bonus material. We’re talking rarities, demos, remixes, a poster, postcards and liner notes from bassist Gerald Casale.